The much anticipated EUROCOM D900K F-Bomb Mobile Workstation featuring Dual Core X2 was released in December 2005. The Highest Resolution Glossy 17-inch Display, most powerful 256MB 7800 NVIDIA GTX Video Card, and a workhorse AMD Dual Core (4800+) 64 Bit Processor - make the D900K F-Bomb from Eurocom the most powerful notebook on the planet today. Combining the latest NVIDIA Graphics performance and AMD's powerful Dual Core technology was the next step in the evolution of Eurocom Mobile Workstations. This means consumers can take advantage of the features they have in the latest workstation class desktops, and have them available anywhere and anytime they choose. This is the zenith of mobile technology, and it is available today. In December 2005, Eurocom was recognized as one of the 50 top technology innovators by the IT Week magazine and received the Top 50 Technology Innovators of 2005 award. The recent initiatives of the Canadian Federal Government to centralize "green projects" and move into "green purchasing" based on Kyoto Agreement objectives has brought a heightened awareness of the green computing issue to the general public. It also prompted Canada-based Eurocom Corporation to address the growing problem of high energy consumption, and design, develop and offer its customers low-power computing solutions. Eurocom was awarded the NASBA New Business Innovation Award for the versatile L570W low-power, all-in-one Portable PC based on 64-bit AMD processor. 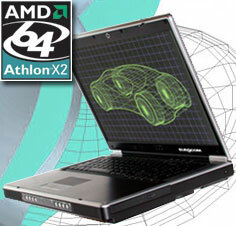 In March 2005, Eurocom Phantom was chosen the most advanced notebook by Mobile Computing magazine. "It isn't every day that we receive a notebook with such an exhaustive list of firsts it can call its own. And so we find the Eurocom D900T Phantom, a computer that makes all that have come before it look positively Jurassic in design..."
"From a storage standpoint, the Phantom is hands down the most advanced notebook ever built."